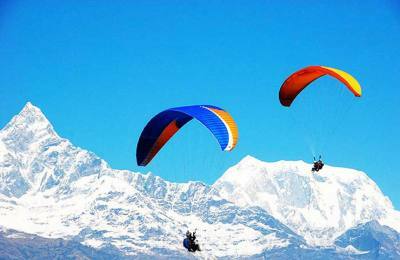 Paragliding in Nepal is started in Pokhara in the first time which was one of the most adventurous in Nepal sky. Nepal is rich in natural beauties, boons and gifts resources wonder. Nepal covers many places and things to attract the tourist by cultural, traditional customs, historical places and its importance, religious shrines and natural available flora and fauna. Paragliding is the simplest and purest form of flying in the sky with the natural and its terrace hills and mountains, whether you dream of soaring above the Himalaya or taking your canopy on holiday with you to explore exotic locations from the air and from the open sky that can view the surrounding mountions of Pokhara, Annapurna south, Annapurna 1, Machhapuchchhre, Himchuli, Gangapurna, Dhaulagiri, Lamjung Himal and others. Similarly, paragliding in Kathmandu has started in the late time located at Godawari village, Near Army camp which offer you the breath taking views of all the mountains of North west from Kathmandu, Ganesh Himal, Mt, manalsu in north west and others like Dorje Lhakpa mountains and Everest range in the north east. Tandem paragliding is a whole new way to see the wold- no motor no noise, just the wind in your ears and incredible feeling of flying in a completely free way in the sky.